Now that I have a house. (Have I mentioned I have a house?) Now that I have a house I did the next thing I wanted to do. I acquired a dog. Meet Red. I adopted him from a City animal shelter. Red is a senior - maybe 7 - 10. I actually called the shelter to be sure he was still available because he had been on the Petfinder website for several months. The various City animal shelters are all kill shelters. Luckily he was and he came home with me. 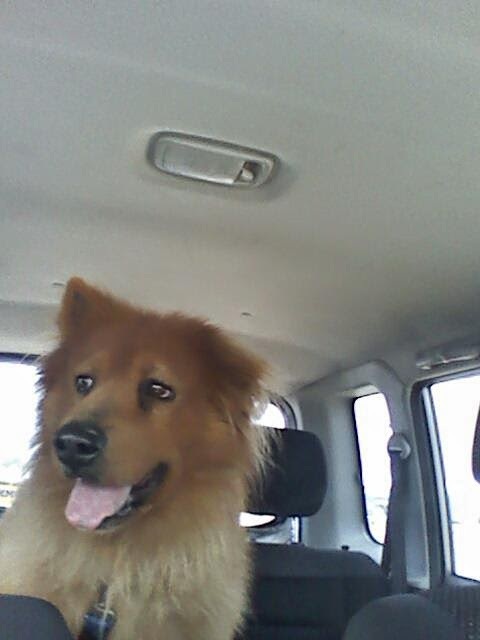 Red may or may not be a Chow cross. One thing I read implied not because his tongue is totally pink. The black tongue is a dominant gene. One thing I'm having to work on with Red is his behavior. He is really a good dog. I wouldn't just say that. He really is a good dog. However, as he settles down here, he's trying to develop Alpha behavior. That's what we're working on. I'm also working on basic commands with him. He knows "Sit," and now he knows "sit" when I use just an arm motion. This weekend we worked on "Come." So far that one is a little bit hard - mostly because Red rarely lets me away from him. How can I teach him to "Come" when he spends every moment right next to my knee? I am so happy for you - the house, the dog! Congrats!! What a cutie! And props to you for adopting an older dog. More people need to be like you!! :) Maybe you should work on "stay" first? Have him sit, then stay as you back away, and then come. I have my dogs sit and wait before they start eating. "Okay" is my release word - if I send them to their crates, or have them sit/stay they have to stay in place until I say "okay" or I send them back.